People of Honduras annually observe Flag Day on September 1. This holiday opens celebration of independence month. Flag Day is observed on the first day of September to commemorate introduction of the first leader of Honduras on Lake Yojoa. Although celebration of this holiday is non-obligatory, certain events are organized across the country. Mostly people prepare for the upcoming parade on Independence Day. National flag of Honduras was adopted in 1866. Originally it had been based on the design of the flag of the Federal Republic of Central America, but in 1866 it was changed and five stars were placed in the center. 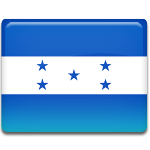 Flag of Honduras consists of three horizontal stripes. The two outer blue stripes represent the Pacific Ocean and the Caribbean Sea and, according to another interpretation, brotherhood and blue sky. The inner white stripe represents a land between two bodies of water, peace and prosperity of the people of Honduras and purity of their thoughts. Five stars in the center of the flag are arranged in X pattern. The stars represent five nations of the former Federal Republic of Central America and hope, that the five nations once can form the union again.